The Bulgarian Society for Protection of Birds has announced the start of its new campaign for the satellite tracking of Eastern imperial eagles. The experts of the Society are going to place GSP transmitters on seven young eagles currently located at different spots around Bulgaria. The initiative is part of the LIFE+ project for saving the imperial eagle and saker falcon from extinction, and is funded with EU money. The satellite tracking allows the Bulgarian scientists to collect and analyze information about the habits of the birds, but also about the causes of their extinction. A total of 20 nesting couples of the Eastern imperial eagle have been registered in Bulgaria but their number is probably slightly higher, according to the Society for Protection of Birds, which is an affiliate of BirdLife International. The preservation of the Bulgarian population is seen as crucial for saving the eagles in Europe and globally. 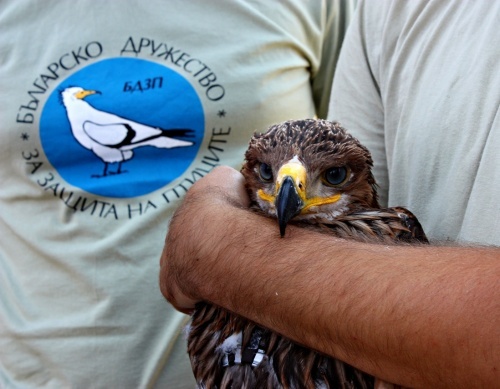 Last summer for the first time, the GPS transmitters were attached to seven young eagles in Bulgaria. Most of them migrated south, with one of them named Boril reaching Saudi Arabia where its transmitter most likely broke as the signal was lost. Two of the birds – Sofia and Topola – came back safely to Bulgaria this spring, which the others died in various causes – two were electrocuted, one was poised, and another one disappeared without any trace. The seven young eagles to be tracked are almost adult but still have not learned how to fly and are in their nests. The satellite transmitters are attached to their backs, and weigh only 70 grams. They are charged with solar energy. A total of 23 young Eastern imperial eagles were hatched in Bulgaria this spring, which means 1.4 per couple, compared to 1.1 per couple in 2009. The couples with young eagles are only 16 compared to 18 last year. Last week a 40-day-old imperial eagle was stolen from its nest in Southeastern Bulgaria. The police are currently investigating the case as the criminals left on the spot part of their climbing equipment. “Despite such incidents we hope that the young eagles will be able successfully to fly out of their nests,” said Svetoslav Spasov from the Society, who is in charge of the LIFE+ project.